Daniel forwarded me a link to the story, The Hand Can’t Be Fooled, Study Shows, from Science Daily. The story is a short piece about research by Ben-Gurion University of the Negev Psychologist Tzvi Ganel and his colleagues on how the “Ponzo” illusion affects visual perception. 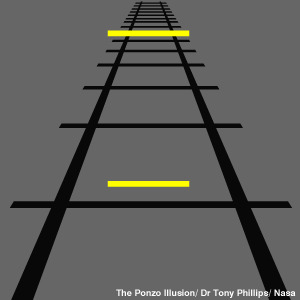 The “Ponzo” illusion occurs when two equal line segments appear to be of different lengths because they are superimposed on a pair of converging lines; like two lines hovering over train-tracks disappearing into the distance appear to be of different lengths, as you can see from this illustration I took from the BBC. The experiment demonstrates that our visual system that gives us conscious awareness of objects also falls for the Ponzo illusion. In contrast, the non-conscious (or much less conscious) movement control visual system doesn’t buy the Ponzo illusion. The finding is not that uncommon; other experiments have also found that the movement control visual system is not susceptible to various sorts of illusions, probably in part due to its rigid egocentric way of perceiving space. It doesn’t really matter to the visual control system whether one line segment is shorter or longer than another in the visual field, it just matters controlling the space between the finger and thumb to grab one or the other. “The idea of two visual systems in a single brain might seem initially counter-intuitive. After all, it seems obvious that it is the same subjective image that allows us both to recognize the coffee cup on our desk and to pick it up” writes Ganel. But this belief is an illusion, as the new research demonstrates. When there is a conflict between what we perceive and what is really out there in the world, it seems that it is our fingers have an advantage. I’m less interesting in which system has the ‘advantage,’ but I am interested in how the evidence clearly shows that our subjective sense of the integrity of vision is not accurate. In other words, in this case, phenomenology can’t really guide an inquiry into the nature of the visual system. Instead, how the visual system achieves the obviously inaccurate sense that vision is integral is a question demanding research and discussion. There is a definite break between our subjective experience of coffee cups and line segments, and the actual ways in which our senses and brain are allowing us to navigate them. It’s not that phenomenology is useless; rather, it poses a whole other level of questions in this case. The second thing that strikes me as deeply interesting about the two visual system hypothesis and this experiment is that it shows up the ‘baroque’ nature of the brain, the way that neural systems do not all obey the same logic in their operations. This makes me deeply suspicious to uniform accounts of brain functioning, like some forms of connectionism (although I think that the whole field of brain science probably accepts some of its basic tenets). That is, some of the things that we hypothesize about how the brain works here on neuroanthropology — like my interest in top-down factors such as ideology and socialization on brain development or how inhibitory mechanisms are important for brain enculturation — will not function in the same way across all neural systems. Even the two visual systems do not function the same way, nor are they likely susceptible to training, modification, or intervention in the same way or to the same degree. The third thing that strikes me as interesting is that, if we’re going to start a neuroanthropology of the senses, we’re really going to have to get beyond the Aristotelian idea that there are ‘five senses.’ I’ve written about this a bit indirectly in my discussion of equilibrium (which I will continue shortly), but I think it bears repeating. The notion that we have ‘five senses’ is itself a phenomenologically-based conclusion, like the idea that vision is integral that we get from our subjective experience, but it is not empirically sound nor is it likely the only conclusion one could reach from the subjective experience of having senses. Until the anthropology of the senses grapples with the data on the senses and perception in research like this study by Ganel and associates, we’re never going to get beyond comparing other people’s folk theories of perception to our own folks theories of the senses (that is, the ‘five senses’ model). The questions we can ask that move beyond this are many; what is it about the phenomenology of sensing that leads to one folk model or another? How might folk models affect sensory education or experience? Do other forms of practical or cultural training lead to subtly different perceptual development? Do other forms of introspection lead some groups to recognize qualities of the perceptual systems that other groups do not notice (something I’ve tried to write about)? Do certain kinds of training allow people to do the ‘same’ tasks with different perceptual systems, for example, do some people use their vision-for-moving systems to judge objects differently than others? Is everyone equally susceptible to these illusions or do some forms of socialization lead to other sensory strategies that are not fooled by illusion like the Ponzi illusion? So whether or not my motor system is better than my visual consciousness in judging object size, even noting that these two systems exists pushes anthropology to ask a whole new set of questions. Downey, Greg. 2007. “Seeing without Knowing, Learning with the Eyes: Visuomotor ‘Knowing’ and the Plasticity of Perception.” In Ways of Knowing: New Approaches in the Anthropology of Knowledge and Learning, edited by Mark Harris. Berghahn Books. Goodale, Melvyn A., and G. Keith Humphrey. 2001. ‘Separate visual systems for action and perception.’ In Blackwell Handbook of Perception, edited by E. Bruce Goldstein. Pp. 311-343. Malden, Mass. : Blackwell Publishers. Goodale, Melvyn A., and A. David Milner. 1992. ‘Separate visual pathways for perception and action.’ Trends in Neurosciences 15 (1): 20-25. Milner, David A., and Melvyn A. Goodale. 1995. The Visual Brain in Action. New York: Oxford University Press. This entry was posted in Brain Mechanisms, Perception and the senses. Bookmark the permalink. What, if anything does this research says about the accuracy of our first impressions of humans? Would a man or women be more “accurate” in what he, she reaches for than what he, or she looks for. Hum. I am imagining singles online clicking through photo’s on dating website.